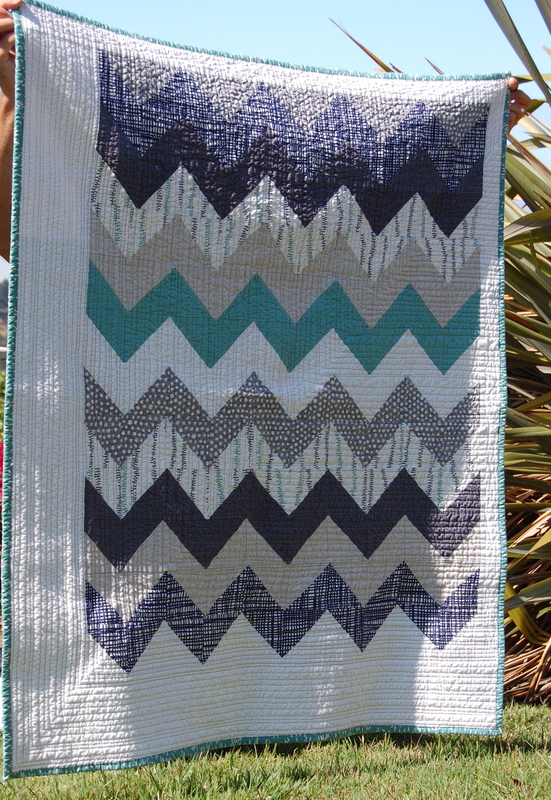 A Little Lotta Chevron Quilt — Finished!!! I love this journey of discovery I’m on with quilting!! Over the past two years, since I’ve become more productive, although still not nearly as productive as I’d like, I’ve learned so much about the process of creating a quilt. I’ve discovered what style I gravatate to, what design elements speak to me and what I think is best to leave for other quilters to try. While I am certain that I am drawn to the “less is more” philosophy of design, I must admit that there are color combos and quilt designs that, while they don’t fall into that category, intrigue me so that I simply feel I must try out for myself. 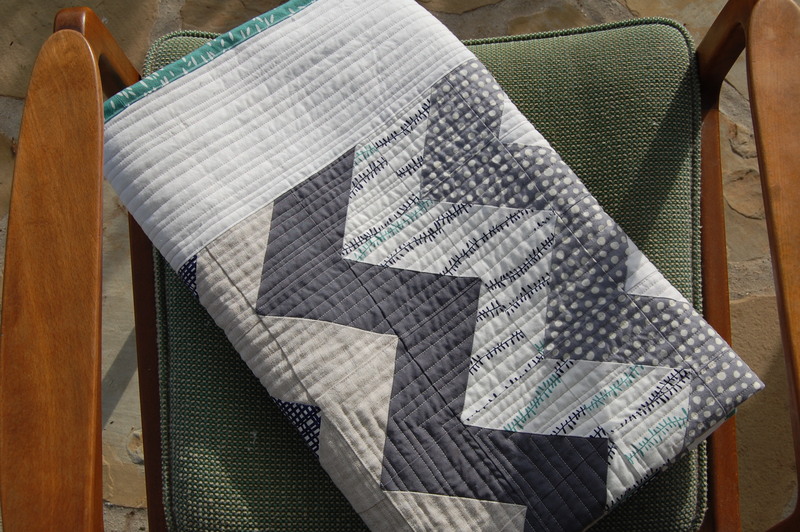 This Little Lotta Chevron Quilt was one of those for me. While the color combination is pretty standard for me, the design is not! I had quite a challenging experience with this quilt, as you can see here and here. I held out hope that the quilting and binding would pull it all together. I also decided a good dose of, letting go of the idea of perfection, was a splendid idea! I loved that I learned about HSTs and how certain methods will give you a bias edge which makes them stretchy and harder to match points, how spray starch can help with this problem, pressing your seams open is good, etc, and so on….. Thanks to many quilty pals for those tidbits of knowledge- especially Irelle whose immense knowledge of all things quilty, is astounding! My most valuable lesson however has been that trying out a new technique and stepping out of my comfort zone is ALWAYS a good thing, whether I get an amazing, show stopping quilt out of it or not! It’s really the experience of trying, stumbling a bit, but then getting back up and learning to look from a different angle, that is important on my creative path. They almost always look better to me after a good wash and dry to give it that fresh and fabulous quilty crinkle! I joined up with Sew Modern Monday at Canoe Ridge Creations; some fun stuff to check out over there! it’s beautiful!! 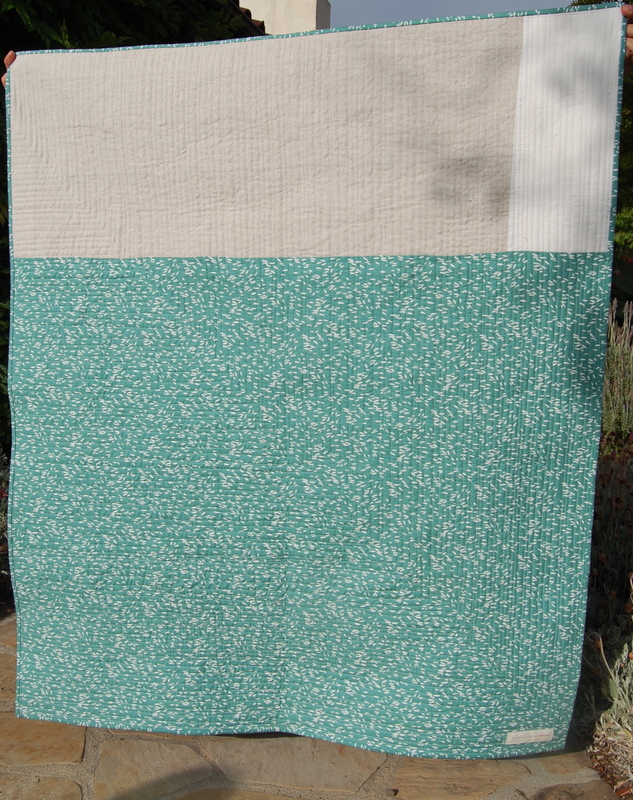 i love how you did the border of white, and of course, i adore straight line quilting!! I really like your quilt and I love your philosophy of the whole experience. This quilt is stunning. I love your fabric choices and your quilting! The quilt is fabulous!! I love the colour combination. 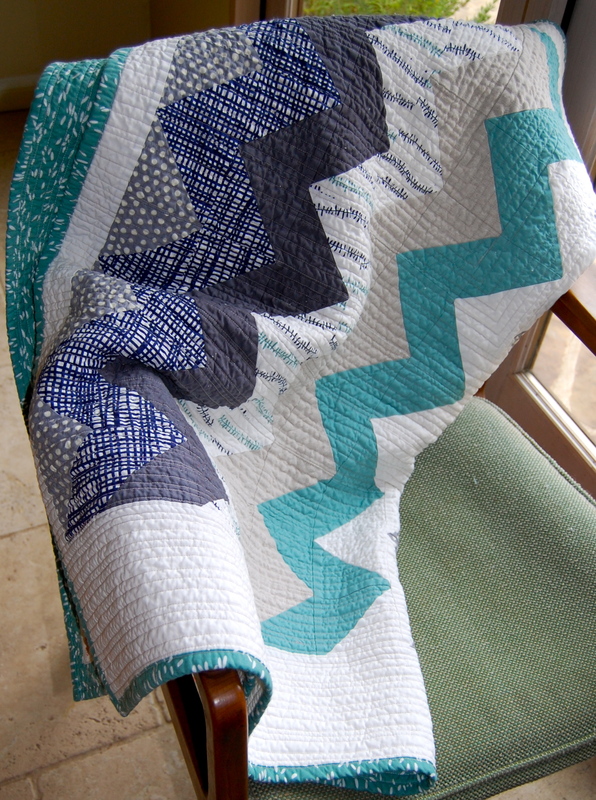 And the quilting is perfect for this ….but wow, it must have taken foreeeeever to do all those lines!! I give you a lot of credit, I am not that patient!! This is gorgeous! I may have to try my hand at it soon. You are growing by leaps and bounds. I absolutely love this quilt and your writing brings a warmth and depth that is wonderful for the reader. Love the quilting on this one. Straight lines are under rated ~ think they should be used more. Beautiful quilt. Your quilting is always SO gorgeous, I think you do some of the most interesting and best quilting I’ve seen! The quilt looks beautiful! That quilt is my kind of quilt. Simple and beautiful!!!! Came over from Canoe Ridge. This is really lovely! Very nice. Inspiration for me…I hope to be more productive. 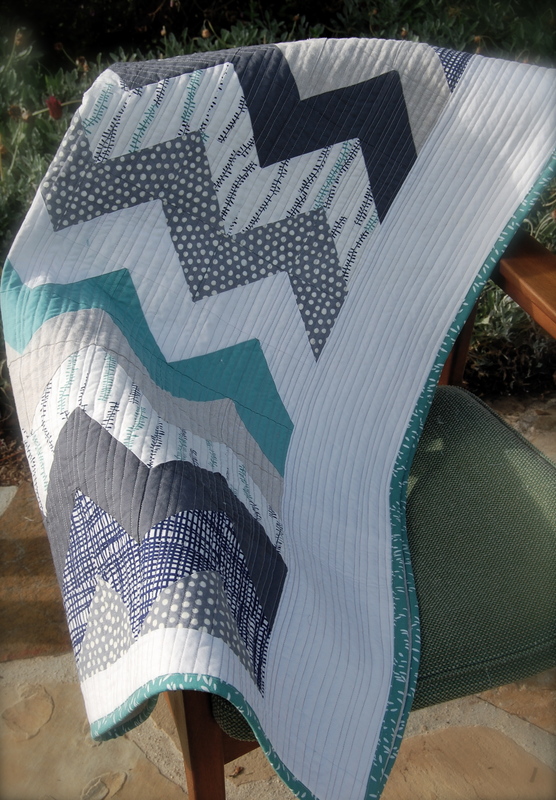 This is so beautiful – I love the zig zags and the quilting is fabulous! Very Nice… I like the zig zags! Love this! It came out so great. I especially love the texture from the quilting. I’ve never been brave enough to quilt that densely. That’s a lot of work. Love your simple labels by the way. Where did you get them? Just lovely! I love the colours together! this quilt is FABULOUS!!! I am a total sucker for chevrons. I have bought 10 yards of Echo and I have just worked out what i am going to do with it. This looks great. I love it, especially the color scheme. I’m gonna definitely use it for inspiration for a future piece. This is stunning. 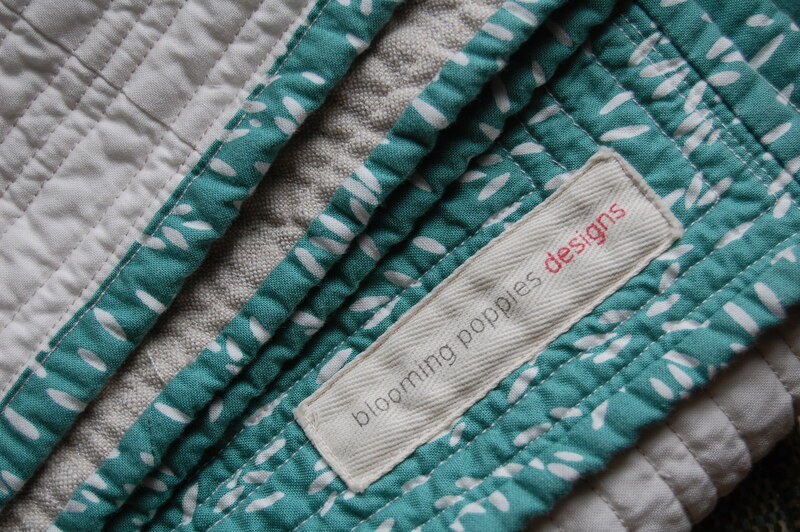 I just love the color combination and the straight line quilting is amazing!! Chevrons always look fabulous to me, but I’m scared of that many HST, the bias seems always stretch too much. I cheat and do zigzags using half-squares rectangles instead, think rail fence with two rails. Congrats on stepping out of your comfort zone. We all need to do a little more of that. By the way, where do you get your labels? Where can I get the pattern for this quilt? I would really appreciate if you e-mail me with that information. Thanks! Hi, Fran back again, I have been practicing, by just looking at the quilt’s picture! 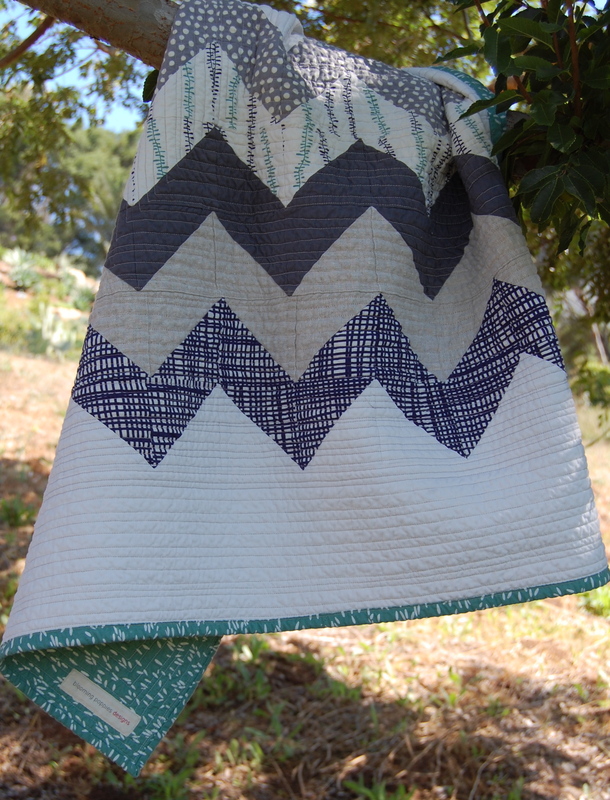 I am a beginner quilter, never heard o chevron quilts ! I cut my square 41/2 inches, but I thik that is to small,would you say 61/2 ?hope to hear from someone, Thanks fellow quilters !!! I hope you got my email a few days ago. Just in case, I’ll post here. Here is a great tutorial on HST making. This is the method I used. There are many other ways, but this one is clearly explained and great way to learn about them- Good luck! I can’t believe I’m just seeing this! It’s fabulous! Love the quilting you did on this, Karen.